Suzanne Lie: Hi everyone. This is Sue Lie, and we are having a recording now to give you some information about the meeting that David Miller and I will have on Saturday, February 17. David, you are going to start off and channel Juliano, and that will tell us both what we are going to be doing. David/Juliano: Shalom, slalom, shalom. Greetings, I am Juliano. We are the Arcturians. We teach our Earth Starseed friends from two perspectives. The first perspective is the Planetary perspective, and the second is your Personal perspective. Today, I want to look more specifically at the Planetary perspective and what stage of development the Earth is now in, and what are the conflicts, what are the issues that are needing to be resolved. Everyone knows that the Earth is very polarized politically, economically, and socially, and also even from a religious spiritual standpoint. What is not apparent is that the planet is in a crisis. The crisis is also related to the issue known as the sixth mass extinction. This is the destruction of habitat, oceans, plants, and animals of unparalleled weapons that now is occurring throughout this planet. And I say that it is comparable to the mass extinction that occurred during the era of the dinosaurs approximately 66 million years ago. We study planets, and we study planetary development. We call ourselves galactic anthropologists because we study primitive planets. We study advanced planets, and we study planets like the Earth that is going through a particular stage of development. We identify five stages of development in planetary evolution. The first stage of development is where the Earth is now, and the Earth is at the end of that first stage of development. In order for the Earth to progress, a resolution of this conflict that I am going to describe must occur. The conflict is wisdom for spiritual understanding and open heart energy and compassion versus technology. Technology is also defined as military technology. Quite simply, the Earth is at the position in planetary evolution of either destroying itself and destroying the planet or resolving the issues and moving forward into the next stage of development, which can be described as approaching a great harmony and unity, and even a fifth dimensional harmonization of the polarizations. What is needed to resolve this? Clearly, the technology that has been developed has brought “advancements” such as computer technology, automobile technology, space craft technology, rocket technology, and sophisticated military destructive weapons. The technology that actual began in the industrial revolution developed a system known as capitalism, but also developed a religion-based theory that humanity can take what it wants from the planet, that humanity can use whatever it wants and can dominate the planet. Even at the price of ignoring the effects on the habitat, the effects on the other plants and animals and even the effects of other “lower” humans, humans who are not in alignment with the predominant view. So this conflict then is also based on the false belief system that man must dominate and control the planet, and man has the right to use the resources in whatever way he wants for his own personal self-interest. But this leads to a technology out of control. This leads to a military out of control. This leads to the self-destruction of the planet. Open-heartedness, the compassion, and spiritual wisdom is the antidote. It is the only level of consciousness that can counteract this out of control self-centeredness and self-interest that is running rampant on this planet now and leading potentially to its destruction. Sue: Could you please give an operational definition of what you mean by wisdom, because wisdom can mean a whole lot of things, so if you can pare that down for people that are listening? David/Juliano: Wisdom implies an intuition, a higher understanding that comes beyond the Earth, beyond the normal third dimension. It comes from a Higher Source. It comes from guides and teachers. It comes from the Angelic world. It comes ultimately from the Creator. It is not an apparent local informational source. So it is not obvious that the Earth is a living spirit. The reason and the information about the Earth as a Higher Being, the Wisdom about the Earth, comes from Higher Sources that are beyond the personal knowledge, the personal gathering of “facts and information” that occur in the third dimension. Therefore, the wisdom implies, coming from the source, it has a greater perspective, a greater understanding of events that are occurring. Perhaps you would like to add, Sue, your perspective on wisdom, because also we are tying in wisdom with spiritual and an open heart, and an open heart energy. So maybe you want to add to this because this is a very important perspective. 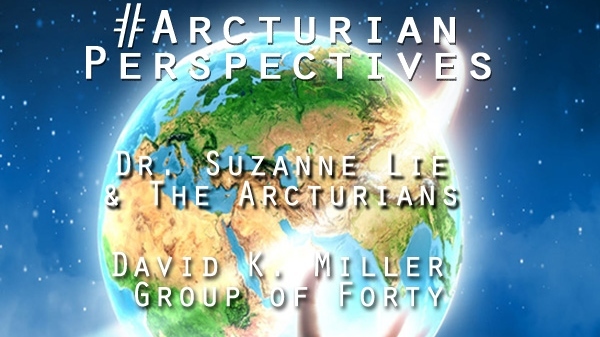 Sue/Arcturians: I would add the component of multidimensionality. We are not just third dimensional humans, and that if we desire to do so and dedicate ourselves to the process through meditation, assisting others, education, we can discover that we are using a very small percentage of our brain. As we expand our consciousness and expand our knowledge, we use more and more of our brainpower, and we begin to even combine the left brain, which is daily life, and the right brain, which is creativity. We can combine both of those sources to shoot our consciousness beyond the third dimension of daily life, and the fourth dimension of our dreams and aspirations, and into this fifth dimensional reality that is a true reality. It is the reality in which we can speak with the beings, the living beings that live on higher planes, and we have made a religion over one living Being that came from a higher plane to serve and then went home. But this is something that happens all the time. These higher beings are always there for us, they’ve always been there for us, and for many of us, they are actually a Higher Dimensional Expression of our own self. Even though we have this third dimensional body, we also have a fifth dimensional and beyond body. When we combine these two components of ourselves, we are able to perceive reality from a completely different perspective. Did you want to talk about that? David/Juliano: Yes, because what you are describing is that humanity, in order to solve this crisis, must connect to their multidimensional presence. They must connect to their fifth dimensional presence. It is only from that perspective that they will be able to understand the unity of everything. What happens in one part of the planet is affecting the other. If one country decides to use more coal, it is going to affect everyone else. If someone decides to build a nuclear power plant, and it fails, it’s going to affect whole oceans. What you are pointing out is correct, and it’s part of the resolution. It’s part of the next evolutionary stage that humanity must go through to incorporate this wisdom, which is to engage in the multidimensional perspective, the higher perspective, and that higher perspective, as you pointed out, includes communication with the higher guides and teachers that are really overseeing and are eager to participate and to teach those who are open-minded on how to resolve this crises. Sue/Arcturians: Yes, and right now we are an example of that because both of us are actually channelling through our higher expressions of selves, our Arcturian expressions of selves, and we both use that in our daily life, in our daily everyday decisions, as well as listen to what are assignments are. We are literally given assignments. Our Higher Selves, our Arcturian selves, our Pleiadian self, our Antarean self, all of these Galactic expressions of our self are able to perceive our Third Dimensional reality from a perspective that is beyond the brainpower of many of the people that are encompassed in the conflict, survival, fear, and all of the hardships that go with being a third dimensional person. However, that person is able to call up and channel in their own Higher Expression of Self, and absolutely every person that wants to do that is able to do that. I find all of the above to be very informative and I look forward to assisting in any way that I can to move us onto our next stage in our development without harming our mother earth and or our inhabitants that share this beautiful Earth. Thank you for sharing such important and helpful info.